Although I spend almost no time watching sports on television, I’m always gung ho for the Super Bowl. I’m probably the most irritating person at a Super Bowl gathering; I merrily show up and ask,”Okay, so who’s playing?” I am completely clueless. As I’m writing this, I, a Chicago native, can’t even remember the name of my birth city’s football team. (Are they the Chargers? The Jazz? The Zebras? It’ll come to me…) I know they used to have a player whose nickname was The Refrigerator, which caught my attention. But if I’m short on info, I’m long on enthusiasm. I’m even willing to cook for the Super Bowl, especially if we go to my brother’s house and all I have to make is an appetizer. It gives me an excuse to revisit my recipe for Bean Dip. 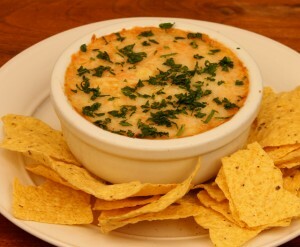 Bean Dip is the perfect choice for the occasion. Chips are involved, which are a mainstay of the S.B. cuisine, and the dip is served warm, which works well on a cold February day (which in L.A. means it’s below 70º). I have sometimes served this on other random occasions, like when I was too lazy to make a real dinner for the kids. I’d give them Bean Dip with a bowl of soup and they were perfectly happy. 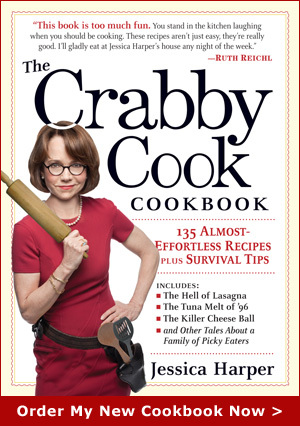 You are currently browsing the The Crabby Cook – Jessica Harper blog archives for January, 2013.